Selecting the right power supply is often the last thing people think about when building a computer. However, it is something that deserves substantial consideration. Although spending more on a quality power supply won’t increase your computer’s performance, it would be one of your best investments, because a power supply failure can take the rest of your computer with it. Furthermore, a decent unit will not need to be replaced when newer parts are installed in your computer. Power supply quality varies greatly among manufacturers, and even among units from the same manufacturer. Determine the company who actually manufactured the unit, rather than the company who put their brand on it, and make sure they are a reliable company. 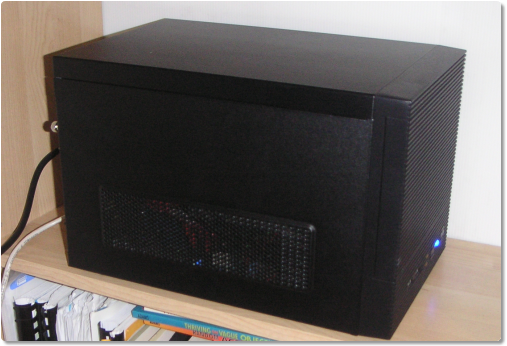 For example, Corsair units are usually made by either Seasonic or Channel Well, who both make decent units. On the other hand, Allied units which come with some computer cases are made by Solytech, who has been known to make ticking time bombs. This information is usually available by looking up the UL certification number, but often times more research is necessary. Another way to determine power supply quality is from opening the unit up. Quality units will have a green PCB, rather than a beige-yellow one (pictured above). They also have quality capacitors rated for high temperatures, and dedicated protection circuitry. 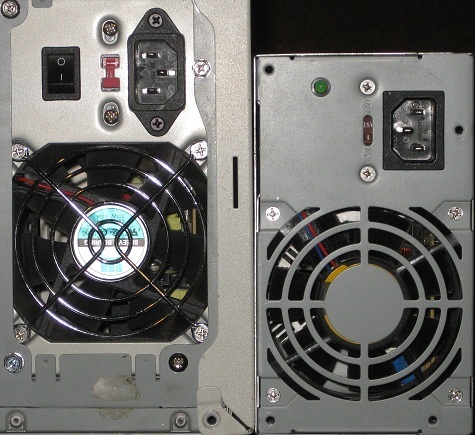 Although the average computer probably isn’t inclined to void their warranty, many power supply reviews contain teardown pictures, as well as expert opinions. In either case, Tom’s Hardware published a great article with information on how to determine your unit’s quality, as well as a table of manufacturers. It is a great resource for determining power supply quality, and a good read. Finally, the power supply’s fan grille is a good indication of quality. A fan grille stamped out of metal is a good indication that corners have been cut, since it is the cheapest style of fan grille. The left fan grille pictured above is a quality unit, while the right one is a cheap model. Even if power consumption from the wall isn’t much of a consideration, the lost energy is turned to heat, necessitating higher velocity fans, resulting in a louder unit. Power supplies bearing the 80 Plus designation and logo have been tested by an independent company who ensures the power supply meets efficiency requirements (80% efficiency at 20%, 50%, and 100% load). Multiple ratings exist for better efficiencies, although there is little difference between designations. Higher ratings can indicate newer/better units, such as the 80 Plus bronze/silver rated Corsair HX series from 2009, compared to the 80 Plus gold rated Corsair AX series from 2011. 3: Avoid power supplies with multiple 12v rails. These rails are usually just separate over-current protection units operating from the same 12v source. While they don’t necessarily decrease the efficiency of the power supply, they do make it more difficult to access the 12v current. 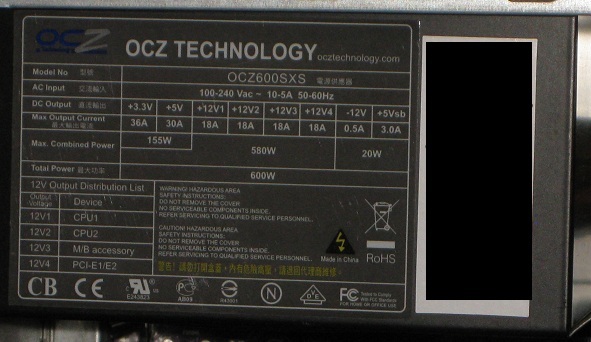 For example, the OCZ600SXS unit is a quad-rail design (pictured above), with two rails to each half of an EPS12v (2×4 pin) CPU connector, one rail to the PCI-e, and one to the motherboard/peripherals. This means that if it were used on a motherboard with an ATX12v (2×2 pin) CPU connector, an entire rail would be lost. Furthermore, even if a very power-efficient CPU (such as a Core i5-2390T) were used, high end graphics cards and multiple graphics card setups could have trouble getting sufficient power. While most multiple rail power supplies only have two or three rails, it can still prove to be problematic, particularly if one peripheral (such as a graphics card) draws significantly more power than the rest of the system. Checking the power supply wattage is not enough. Make sure that most of the current is available from the 12v output. Modern systems draw the most power from the 12v line. Since this wasn’t always the case, many older designs provide most of the power on the 5v or 3.3v lines, which does no good for modern systems. For example, consider a Logisys PS480E12 480W power supply, and a Thermaltake TR-380P 380w power supply. While the Logisys unit is rated at a much higher wattage, its 12v current rating is just 16A, whereas the Thermaltake 12v rating is 30A. Therefore, despite the lower power rating, the Thermaltake unit is much better suited for modern computers. 5: Buy a power supply sufficient for your needs, and no more. Although the market is flooded with high current power supplies, you might be surprised at how little power your computer requires (A quad-core i5-2400 and GTS 450 can require as little as 300 watts). Furthermore, efficiency of power supplies significantly drops under light use, which is why 80 Plus power supplies aren’t rated for less than 20% loads. While the increase in power consumption may be minimal, higher-wattage power supplies will still get hotter, necessitating more airflow. OuterVision eXtreme publishes an extensive power supply calculator utility for free, which can give you a great idea of how much power your system needs. The paid version will also tell you how much current on each voltage you should look for. Feel free to plan for future upgrades. But if you don’t expect to be running large hard drive arrays or multiple graphics cards, don’t waste your money on an overly powerful power supply. When you’re working on your Linux or Mac OS X system’s command line, the prompt is the text to the left of the commands you enter. The default prompt varies for every system, but it usually gives you an indication of your username, your machine’s host name and your current working directory. Also, it ends with a dollar sign $ if you’re working as a normal user. If you’re working with root privileges, it ends with # instead. The prompt can be customized to include relevant information that can help you increase productivity, to hide information you don’t care about, or to highlight the lines in your terminal output where you entered commands. This post will show how to customize your bash prompt, and, in the process, explain a few of its more advanced features that improve your productivity. Bash is the default shell on Mac OS X, available for all (or most) Linux distributions, if not already included, and available on Windows via Cygwin. Ask some Windows users why they aren’t using Linux and chances are you will hear “because [program] doesn’t have a Linux version.” Although cross-platform software is popping up all over the place, there are still a number of applications that are restricted to a single platform – and for a lot of software, that platform is Microsoft Windows. However, all is not lost. Although Linux has its own executable format and set of system libraries, a tool exists that will allows us to run a good portion of our Windows applications directly in Linux. This tool is of course, Wine. Wine initially began as a small project that was designed to run simple 16-bit Windows applications. As time went on, the target shifted to 32-bit applications and the long and hard process of rewriting Windows’ user-mode libraries began. After reading a review of the Drobo FS, I became obsessed with network attached storage (NAS). I realised that a NAS device would neatly solve a couple of long-standing problems I hadn’t got around to fixing: data backup and data organisation. This post will explain how I picked the hardware and software for my NAS. Announcing the Winners of the Super User Anniversary Contest! Super User turned two years old a few weeks ago. To celebrate, we held a Super Contest to reward you, our dedicated users! To read up on the contest categories, check out the announcement blog post. We’ll be working with the winners to figure out exactly what fancy Super Goodies they’ll be receiving. If you’re one of the winners listed below, make sure to watch your email for information about your prizes!